Texas State Capital building, September 2018. Texas' top financial official says heightened economic "uncertainty" from rising interest rates to unsettled trade policy is clouding the spending picture for state lawmakers who return to the Capitol this week. Texas Comptroller Glenn Hegar said Monday that a robust economy will give the Republican-controlled Legislature more spending power than in recent years. But he warned that a slowing global economy could have an outsize impact on Texas. 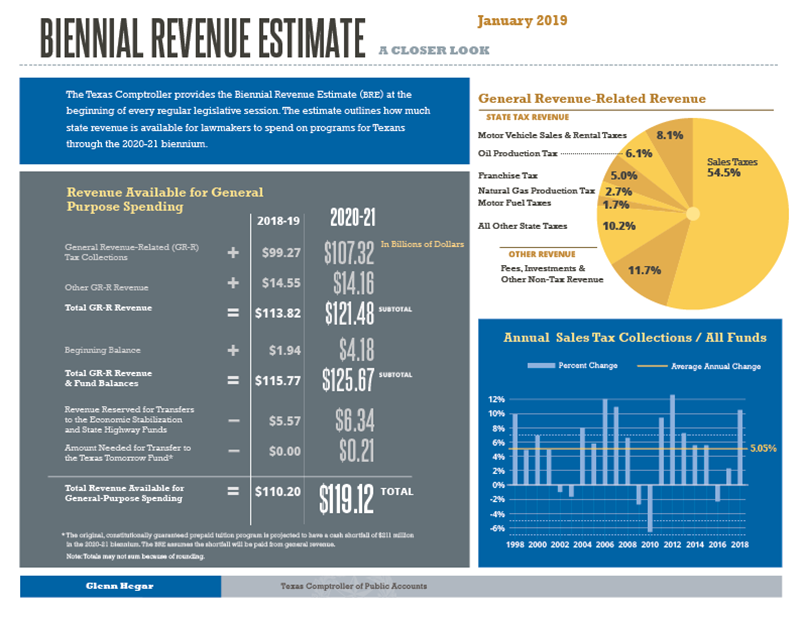 Hegar released his biennial revenue estimate Monday, outlining how much state revenue is available for lawmakers to spend on programs through the 2020-21 biennium. Hegar's estimate for the upcoming biennium was $119.12 billion, up from $110.20 billion in 2018-19. See a larger version of this image here. Texas Gov. Greg Abbott said Hegar's biennial revenue estimate "reflects the continued strength of the Texas economy" and that "even with this strong economic growth, Texans expect their government to live within its means, while funding its priorities." Abbott added that he looked forward to working with state legislators to address many key issues including school finance reform and property tax reform. Lt. Gov. 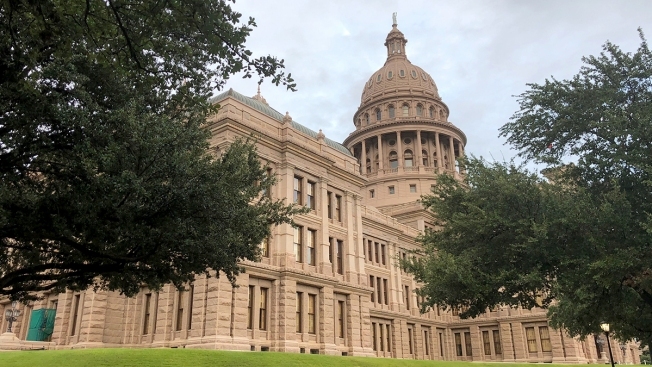 Dan Patrick, who in his role is the presiding officer of the state Senate and the chairman of the Legislative Budget Board, said Monday he was pleased Hegar's estimate confirmed the Texas economy remained strong despite cyclical fluctuations in the oil and gas industry. "This matches the Senate projections. We face a broad range of fiscal challenges in the 86th Legislative Session and we are committed to property tax reform, increasing teacher pay and school finance reform. We are confident we can accomplish these goals," Patrick said. The Texas Legislature returns to work Tuesday. The budget forecast weighs heavily as lawmakers come back to tackle a number of big-ticket items from school finance to paying for the aftermath of Hurricane Harvey. Hegar said the ongoing federal government shutdown is having no immediate impact on his estimates but that his office is watching the impasse closely.